"Jackson's great debut album, Storm Chaser - a bracing collection of furious fret workouts ... simultaneously impresses with slick jazz virtuosity and entertains with unusual turns of phrase. Out of this world." "Jackson, a rock-fusion maestro ... Storm Chaser is a guitar feast ... dazzling acoustic playing." In his formative years Jackson won five 'Outstanding Musicianship' awards from the National Association of Jazz Educators and one from the 'American Honor Arts Association' before attending the Berklee College of Music. 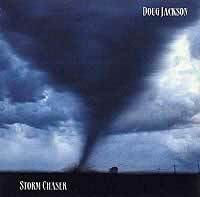 Storm Chaser is a stunning collection of virtuoso Jazz, Fusion, and Rock guitar playing. With a stellar career spanning the vast majority of his life, Doug's guitar playing has been heard on 'Baywatch', Showtime's 'What Really Happened During the Cuban Missile Crisis', NBC's mini-series 'Drug Wars', Fox's 'El Corazon Del Beisbol', NBC News, and The American Film Institute Awards, and he's been seen on NBC's 'Late Nite' and WB's The Wayne Brady Show.. Commercials include Oldsmobile, Toyo Tires, GT Bikes, Coca-Cola, and Pearlvision. Recording and touring highlights include Kenny Loggins, Ambrosia, Dave Mason, Al Stewart, Gary Wright, Edgar Winter, Billy Preston, John Ford Coley, Stephen Bishop, Rick Derringer, Maxine Nightingale, Marie Osmond, Roberto Carlos, Iron Butterfly, Bryan Duncan, Steve Lawrence & Eydie Gormet, Zsa Zsa Gabor, Nancy Sinatra, Dweezil Zappa, Mac Davis, Mark & Brian(KLOS). His many other recordings and studio dates include Lanny Morgan, Lou Levy, Barbara Morrison, Sam Riney, Peter White, Abraham Laboriel, Justo Almario, Rev.Dave Boruff, Jeff Porcaro, Max Bennett, Vinnie Colaiuta, Jimmy Earl, Jimmy Haslip, Lisa Richards, Gregg Bissonett, Neil Stubenhaus, Dean Parks, Lenny Castro, Carlos Rios, Marcus Miller, John Robinson, Toni Rizzi's Wire Choir, Nick Ceroli, Steve Madaio, Tom Saviano, Joey Heredia, Michael Fisher, Dave Marotta, Alex Acuna, Ricki Lawson, Monty Budwig, Emil Richards, Joe Porcaro, Dave Stone, and numerous gospel recordings such as Hosanna Integrity Music & Word Records. Not enough? How about shows like Pageant of the Masters Orchestra, Joseph and the Amazing Technicolor Dreamcoat, Violet, West Side Story, Godspell, The Music Man, and The Santa Barbara Chamber Orchestra?